Amazon, Microsoft, and Google (Alphabet Inc.) have been battling for dominance in the arena of cloud computing for almost as long as the term has been around. The growth of software as a service (SaaS) was started and fueled by enterprises seeking ways to deliver tools over large networks. This industry is not only growing, but it is also evolving to include more than just SaaS. According to the Wall Street Journal, the combined capital expenditures for the big three were $31.54 billion in 2016, which is 22 percent higher than investments from 2015. A substantial portion of these costs has gone into server farms. Amazon just announced “plans to plunk down a massive collection of data centers in Stockholm,” reported WSJ. Amazon did not reveal how much the new region of data centers would cost, but analysts estimate that “several hundred million dollars” is not an unreasonable guess. An investment of this size would obviously have a proportionately high ROI (return on investment), and according to the Wall Street Journal, it does. Software as a service is evolving into what is being called, “hyperscale computing.” It is not just software in the cloud that businesses are looking for anymore. Now they want their infrastructures hosted as well. 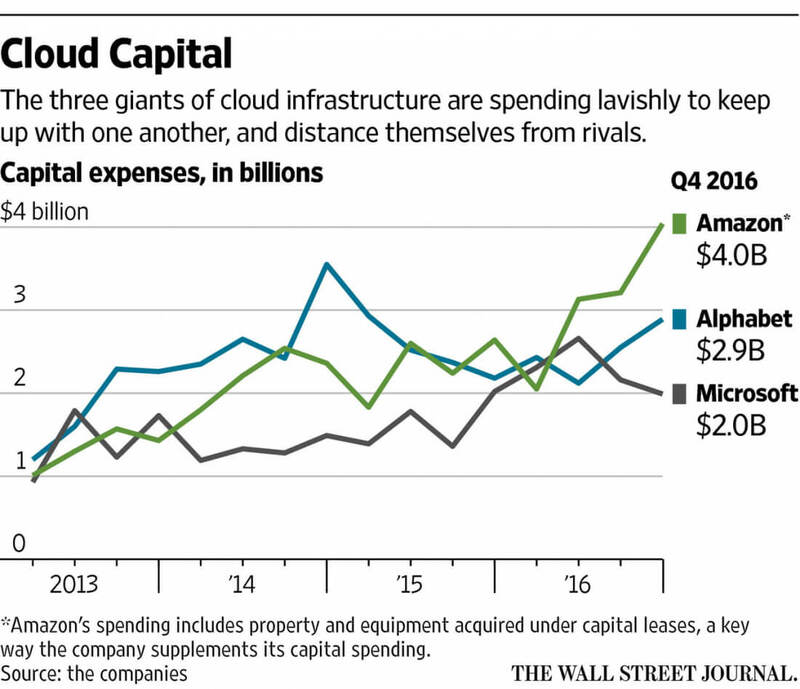 Most of that spending was in moving from company-owned servers to servers in the cloud. Part of the draw to infrastructure as a service (IaaS) is scalability. With physical, on-premises servers, companies are limited during peak traffic periods. The WSJ provides an example of how a fantasy football site crashes right before kickoff due to the traffic volume being higher than its servers can handle. With IaaS, resources are virtually unlimited and can be scaled on-demand and in real time. Oracle is another company that has been seen investing in data-center development. 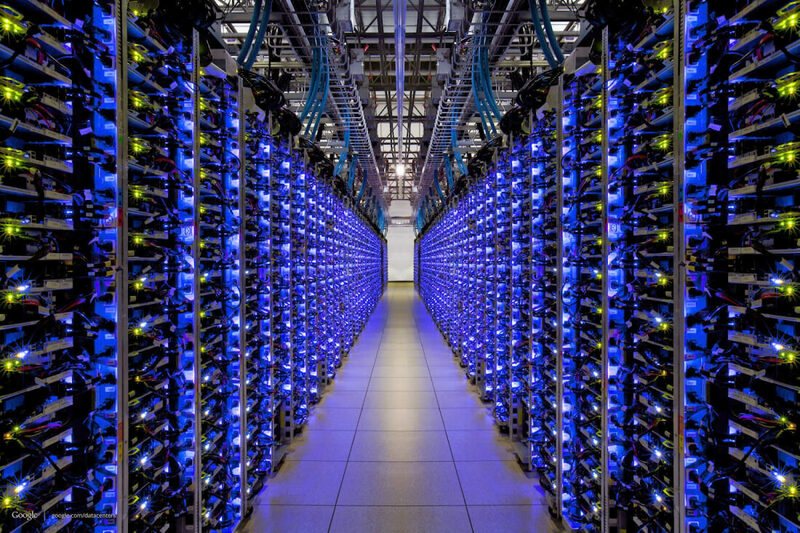 In its most recent fiscal year, Oracle funded $1.7 billion on server farms. While this expenditure is small in comparison to what the big three have budgeted in the last year, Oracle is confident that it can compete. Steve Daheb, senior vice president of product marketing for the company thinks Oracle’s infrastructure services are superior to its competitors. For this reason, he feels the company does not need to spend “as much on data centers.” However, the Journal points out that the numbers do not seem to support this claim. It would seem that Oracle is significantly lagging behind and it will be difficult to catch up. Amazon, Microsoft, and Google have already invested so much into computing capacity that they have built a barrier that can only be breached by investments going into the tens of billions of dollars. Such massive expenditures are easy to see when a region for Amazon Web Services runs between $300-$600 million. Add to that the maintenance and other overhead involved with running the facility, and one can understand why Amazon, Microsoft, and Google are expected to dominate this growing industry. Everybody wants to rule the world... It's fearful, and tearful. Reehahs, ikesmasher and Cal Jeffrey like this. Good. I wonder how many others will? A few I suspect but many won't.